Ink jet CAD – Dipl.-Ing. R. Matai e.K.Dipl.-Ing. R. Matai e.K. When your bril­li­ant idea in mecha­ni­cal engi­nee­ring, archi­tec­tu­re or elec­tri­cal design is prin­ted, then your job is done. – We sup­port you for per­fect out­put with Matai CAD pro­duct ran­ge. 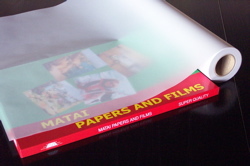 We offer a wide ran­de of CAD Ink­jet Papers and Films. Typi­cal app­li­ca­ti­ons are design, mecha­ni­cal and elec­tri­cal engi­nee­ring, geo­gra­phic app­li­ca­ti­ons and archi­tec­tu­re. non-coated CAD Bond Papers (for mono­chro­ma­tic or line prints). coated Ink­jet-Papers for CAD-App­li­ca­ti­ons, being sui­ta­ble for full colour tech­ni­cal prints, che­a­per than our Gra­phic Art Ran­ge. Ink­jet Spe­cia­li­ties like colou­red Ink­jet papers, CAD-Films others com­ple­te our ran­ge.